Even though it is quite chilly here in Minnesota, I am still hanging onto fall! Last weekend we drove along the Mississippi River Valley, to check out the fall colors. According to the Minnesota DNR, it is one of the only places left in Minnesota that has color still. 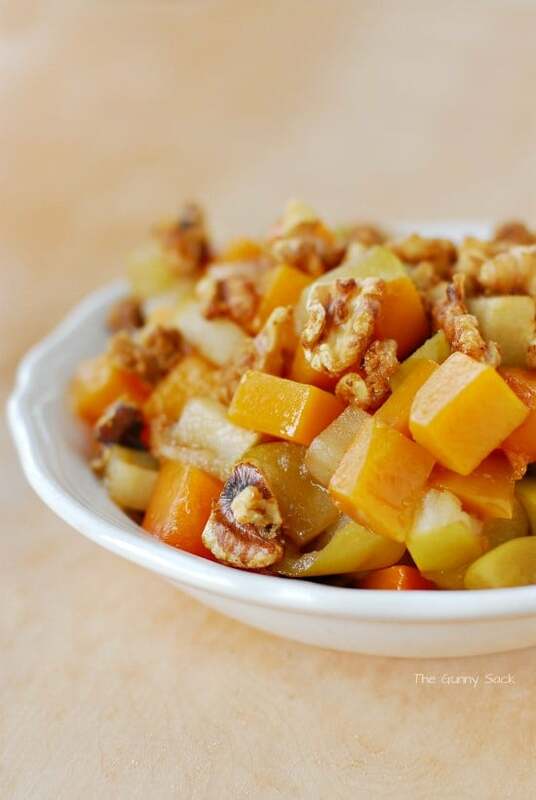 With that in mind, I created a fall dish of Roasted Butternut Squash with Green Apples and Candied Walnuts. I created a recipe using 3 of the seasonal ingredients from the fall seasonal menu. 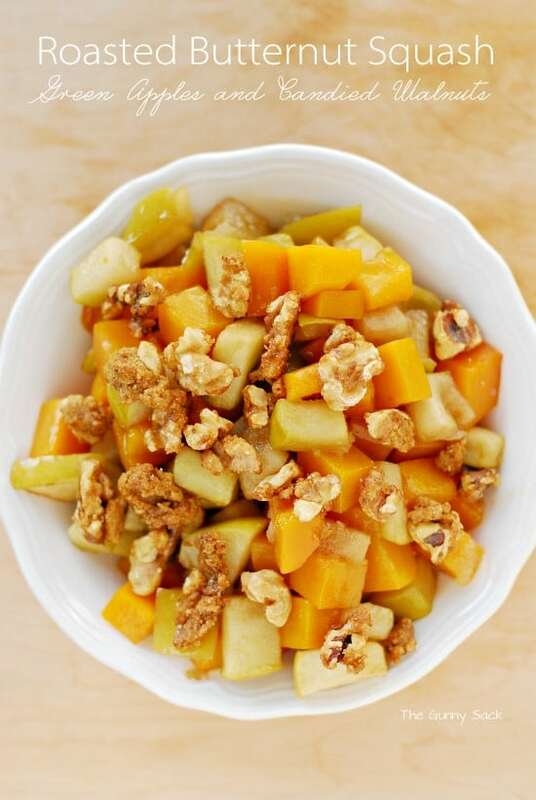 I chose butternut squash, green apples, and candied walnuts. Next, I peeled and sliced the butternut squash. Then, I cut up the green apples. 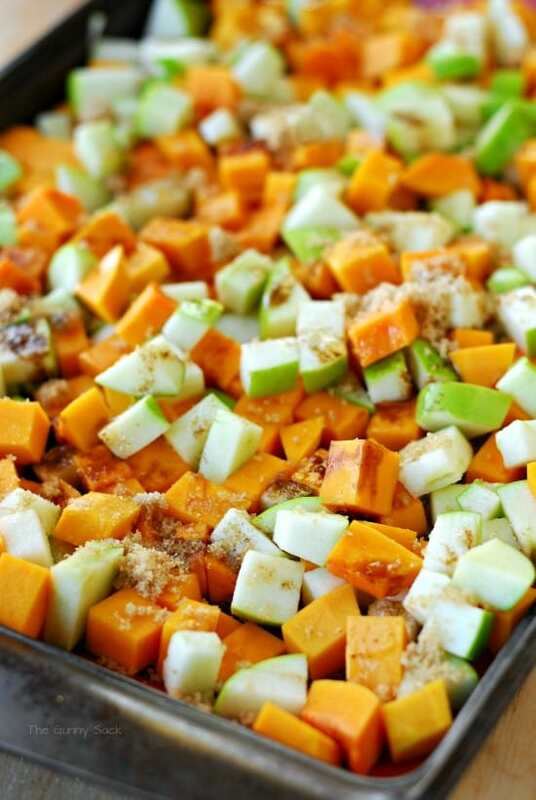 Whisk maple flavoring into olive oil and drizzle over the butternut squash and apple mixture. Sprinkle with brown sugar. Bake at 375 for about 20 minutes, stirring every 5 minutes. 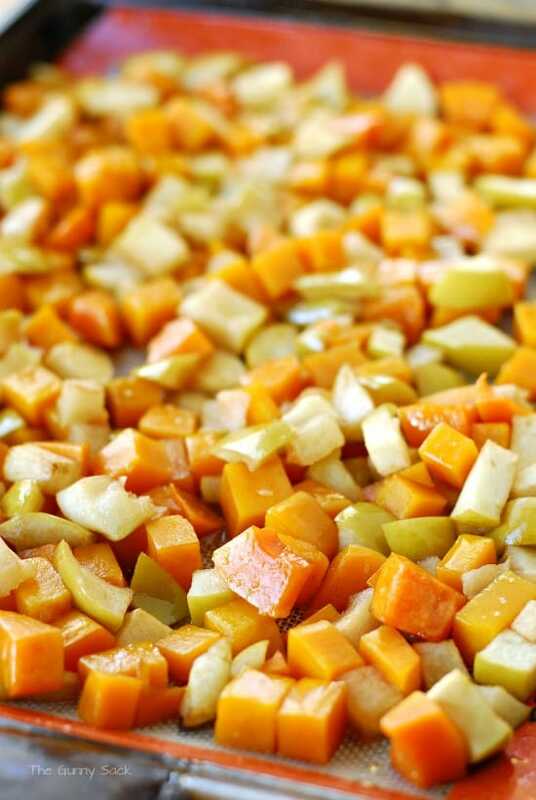 Serve the butternut squash and apples while warm. 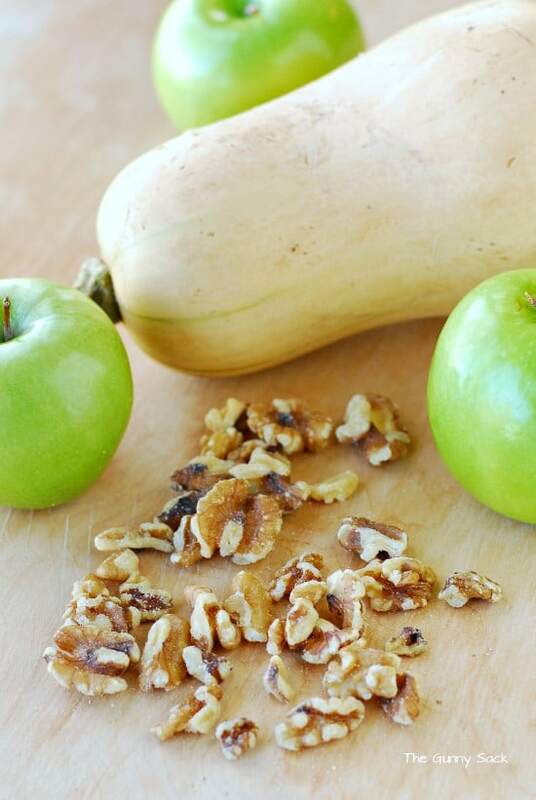 Remove from the oven, place into dishes and top with candied walnuts. Would love to make this recipe but have 2 diabetics in my family. 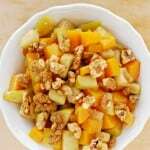 Candied nuts would add too much sugar, would plain toasted walnuts work? I plan on using the brown sugar with maple flavoring. also, may I sub Fuji apples for the green apples? Yes, you can use plain toasted walnuts. Yes, Fuji apples will work instead of the green apples. Enjoy! help? In making this recipe, my squash and apples were swimming in liquid, and my oven was extra smokey after being in only 10 minutes. I know I put in the right amounts of oil/sugar/maple – what did I do wrong? Since the recipe calls for 1/4 cup of olive oil, I’m guessing the liquid must be from the squash and apples? Did you continue baking it? How did it turn out in the end? I poured off a small ramekin worth of liquid, about 1/4 cup, and continued baking it. The flavor was great. I topped it with candied walnuts and dried cranberries. I made this recipe last year and it was delicious. When I returned to the website this year, I can’t find the actual recipe proportions. How many apples, how much brown sugar? If you still have this information, could you please share it? I would like to make this for Thanksgiving. I used three apples. Enjoy! How many servings does the recipe make ? This is such an easy and light recipe, perfect for me. 🙂 However, walnut is not my biggest favorite. Is this also good with peanut? Could I use maple syrup instead of maple flavoring? Maybe less brown sugar if I do? Yes, you can! I used what I had on hand at the time. Yes, you might want to use less brown sugar. Enjoy! Tonia, sounds delicious! Is there any reason you chose maple flavoring over maple syrup? You can use maple syrup too! I just used what I had on hand. Enjoy! Making this for dinner tonight. You photos look amazing. Thank you! Never mind. Got it now. Duh!! I’m sorry, where is the recipe? Tonia,I wish our printer was working. I would love to print out all the recipes that you share with us. The only ones that I personally would not print are the ones that have Shrimp & Mushrooms. And we never do Guacamole in my family. The good news is that you probably won’t see any shrimp or mushrooms recipes here. But the bad news is that I love guacamole! Thanks Anna!